This Multi-Fit Standard wet dry vac filter captures everyday dirt and debris, and the wet vac filter can be washed to improve performance. Does Not fit WORKSHOP Wet/Dry Vacuums. Does not fit these Shop-Vac Models: 5 gallon Wall Mount, 5 gallon model H87S, 5 gallon HangUp, and 6 gallon P12S Vacuums. Does not fit Vacmaster* VWM510. Fits: Most 5 gallon and larger Shop-Vac*, 5-16 gallon VacMaster* and Genie shop vacuums. *This is NOT a product of, nor is it sponsored or endorsed by Shop-Vac Corp., VacMaster, or Genie. Shop-Vac is a registered trademark of Shop-Vac Corp. VacMaster is a registered trademark of Suzhou Cleva Electric Appliance Co. Genie is a trademark of Genie Corp. 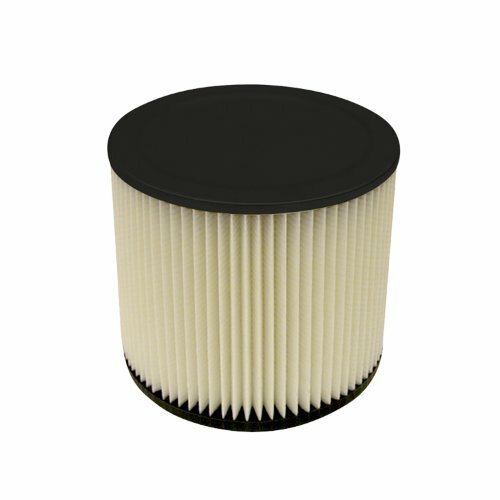 The pleated cartridge filter design on this wet dry vac filter allows a filter to have more surface area in a confined space to improve airflow and reduce clogging compared to sleeves and bags. Multi-Fit wet dry vac filter with standard filtration captures everyday dirt such as sawdust and typical dirt. This wet dry vacuum filter fit most 5 gallon and larger Shop-Vac®* and Genie vacuums, as well as 5-16 gallon VacMaster®* shop vacuums.. This NOT for use with WORKSHOP Wet/Dry Vacs.